Based on the game 6 Nimmt!, The Walking Dead Card Game is an action card game of zombie survival where up to 10 players can join in and compete in either Hero mode or Survival mode to eliminate as many zombie cards as possible and rack up the most points each round. With more than 100 zombie cards, players will have to make the right decision each turn to ensure they score as many points as possible while making it more difficult for their opponents. Character cards will give you a one-chance advantage each round to make the first move and rack up the zombie points before anyone else. Through the combination of luck and strategy, fun is unlimited in this game where every card will feature a variety of zombies from The Walking Dead. Will you survive the zombie onslaught? The Walking Dead Card Game is a quick, 10 – 30 minute game, offering both Survival Mode (for 3 – 10 players) and Hero Mode (for 2 – 6 players). Choose a character from The Walking Dead to help give you that extra advantage you need to win the game in Hero Mode. The goal for each player in Hero mode is to collect points by defeating as many zombies as possible. The player with the most points at the end of the game emerges victorious. In Survival, each player wants to avoid gaining any zombie points, as the player with the fewest points is the winner! Based on the game 6 Nimmt!, designed by Wolfgang Kramer, who has won numerous accolades including the Spiel des Jahres, a prestigious, German card and game award. As I’m not the greatest fan of the T.V show The Walking Dead I was unaware of this game but on my recent jaunt to town for Free Comic Book Day I spotted this on a shelf, and wanting to buy at least something on my visit, thought I’d give it a whirl. The box art is what you would expect from a media tie in game, a generic shot of the hero looking, in this case, moody and determined with his revolver while standing in an apparently grey world devoid colour. I know the show isn’t a riotous colour-fest but this game could be easily overlooked with the drab box. The blurb on the reverse reveals that the game is based on a game called ‘6 nimmt!’ by Wolfgang Kramer, winner of a fistful of awards including the Spiel des jahres (Game of the year), one of the most prestigious accolades in board/card gaming. The rules are presented simply and are easily understood, the book itself is a simple four page affair explaining the two game modes, Survivor and Hero. The cards are where this game falls flat on its brain munching face! They feel good, that’s at least one good point, they shuffle well and feel as though they will stand up to a decent amount of play but that is where the praise ends. The card art just looks like basic DVD rear cover screen grabs of various zombies. Of the 104 zombie cards, numbered from 1 – 104, there are only five different images. This being a 6 nimmt clone that is understandable as it is one of the game mechanics but the pictures chosen are awful! The one you see the most of (76 of them to be exact) is of a rotting woman’s face and it’s far from the most appealing card considering it is the most common. The other four are of larger groups of shufflers and are equally drab, but not as bad. The 6 hero cards are, again, effortless screen captures from the show with the exception of Rick, the main protagonist of the show for those not in the know. Ricks card is the laziest piece of **** I have seen in a game for a long while. It features the self same image that is on the box cover, the rule book and the card backs! Yes, the card backs. This means that the card has the same bloody image on both sides! LAZY! Considering the quality of Cryptozoics other efforts, games the likes of the DC Deck Building game (even though this has been thoroughly outclassed now), Food Fight, the World of Warcraft trading card game and Penny Arcade: Rumble in R’lyeh, this game seems like a poorly put together, phoned in effort. It may be a slightly modified version of an existing game system but they could have put a little more thought into the look of the **** thing! It plays well but the lazy copy and paste approach to the appearance damages it. In stark contrast to the previously stated ‘Google Image Search’ approach to the art the gameplay is really good! Especially the more players you have! Each player has a hand of 15 ‘Walker’ cards and one hero card and the aim of the game is to have the highest value of walker cards when the players are all out of cards. In the centre of the table four walkers are placed in a vertical row to serve as your starting cards and each turn players play either one or two walker cards onto one of these four rows. The cards played must have a higher numerical value than the card before it in the row unless you do not have a card higher than any on the table, in which case you must play a lower value one onto the current highest value card. Once a row would have the sixth card played onto it, the player takes the five existing cards and puts them to one side (these will be used for scoring at the end of the game) and the sixth card becomes the first in a new, replacement line, so on and so on until all players have no cards left, at which point the players count the bullets on their captured/killed cards and the highest wins! Simple yes?….No! The game has a remarkably simple concept but has a tactical element that will have some thinking multiple moves ahead! This is the closest the game comes to the original 6 nimmt. Each player has a 10 card hand and the cards are played in the same manner as before but his time the aim is to take as few of the cards as possible, or at least the lowest scoring cards possible ad the hero cards are not used. Once all 10cards have been played by each player the bullets are counted and the fewest wins. I am aware I may not have explained how well the game plays as it is a very simple game but it is quite enjoyable, just let down brutally by the appallingly lazy aesthetic choices made, hence I’m giving this game 4/10. I would happily give it 6 or even 7 but the appearance is so lame that I can’t even justify a 5. A good example of a lazy tie in, if you see it for a couple of pounds (or currency of your choice!) pick it up but don’t pay full retail value, it just isn’t worth it, buy 6 Nimmt instead, at least that won an award! This is an abstract game that uses the walking dead franchise for marketing purposes. – It doesn`t matter witch player card you choose, it doesn`t make a difference, the effects are all the same. The game is a derivation of the Nimmt – a game that i enjoy – but instead of winning by gathering the least points possible, you do the opposite, try to get the most points. Everything else, except the player cards, are the same. The character cards give a small twist, where you can play them for a bonus, and that’s it, it doesn`t matter which character you choose, its all the same. This game adds nothing, in fact the reverse of the score it kinda ruins the theme – are we trying to kill the most zombies because it is a competition to get more zombie heads? There was also a different type of game that i did not try, so i cant review it, but it felt that they where trying too hard to justify this game existence, and failed. From my understanding the survival mode was the reverse scoring and plus some other stuff that sincerely i wasn`t inclined to play. When i bought this game i wasn`t expecting much, but the game disappointed me with the marketing lie. But it was my fault i was mislead by myself and my feelings of liking the Nimmt game. If you can overlook the card details and are a diehard fan of walking dead and like a somewhat flawed Nimmt game, go ahead, otherwise run from them like the plague. Replay – Plenty if you enjoy and dont get bored by the same images over and over again. Components – The cards seamed decent but the deja vu, ruined it for me. One can argue that the cards of the Nimmt game are also repetitive, but the kind of style ( not being fotos of people ) it softens your perception and the minimalism is nice. I received this as a Secret Santa gift at Christmas. My first thought was that this would be great since I’m a fan of the series. It’s a simple card game with no real substance. In both Hero and Survival mode, you play cards in a semi-strategic manner, trying to either gain points (Hero) or avoid points (Survival). The odd Hero card can be played to allow your card to be played first, either aiding yourself and/or screw your opponent. Whomever ends with the most/least points wins. A round can take just a few minutes. This game could’ve been a tie-in with any franchise making Hero cards out of any characters and the zombies any sort of villains. For instance, Batman. All the Hero cards could consist of Batman, Robin, Batgirl, Nightwing, Red Robin and Catwoman. The villains could just be listed as henchmen with different “points” allocated for them and the joker, riddler, etc being more points. Like I said in the title, it’s just cashing in on the brand because they know people/fans will buy it. Avoid it if you can and get one of the board games instead. In this post-apocalyptic card game, you are out for as many Walker kills as you can muster in this fast paced endeavor. Will you come out on top, or will walkers overrun you? Only making good decisions will help you survive! Parental Advisory: Parental Warning – 4 different zombie pictures. 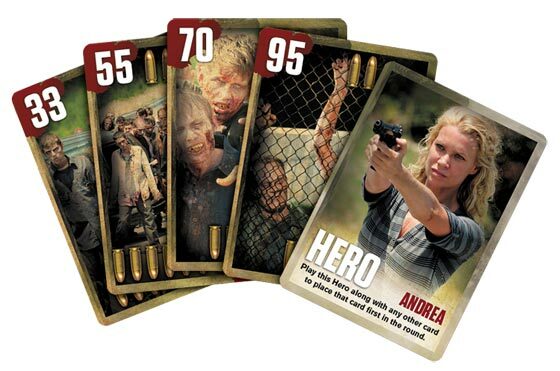 In The Walking Dead Card Game you have two different modes to be able to play in, Hero Mode and Survival Mode. In this mode, The players are trying to kill as many points as possible in Walker cards. They do this by collecting rows on the table and there are 4 rows going at all times. The cards have a number of bullets in the top right corner which tell the player how many points each card is worth. The players will set out 4 random cards in a line top to bottom to start the 4 rows. Deal each player 15 cards to their hand, which they can look at the whole time. In each players hand they will pick and add one Hero card for a total of 16 cards. This allows the player to play first if they lay down 2 cards this round. Hero cards may only be played when paired with a Walker card. If more than one Hero card is played in a turn, then those cards will be played in numerical order, before the rest of the non Hero Walker cards are played. Each round, each player lays down 1-2 cards, face down simultaneously in front them. They then flip them over at the same time and go in the order of the number of the cards laid down. Each card has a number in the up left corner from 1 – 100. Lowest goes first unless, someone played a hero card, then that player goes first this round. Each player takes turns placing the cards in so that the card being placed has the highest value the card furthest to the right in the row. For example if the row had cards 42, 56 and 61 and the player’s card was 53, that card couldn’t be placed in that row. The card being played has to be higher than all the cards placed before it. If the card was 72 for example, then it could be played in that row. Whichever player, plays the 6th card in that row, they capture it, pick up all the cards and adds them to their victory point pile. A new row now begins in that spot with that 6th card. If the card being played is lower in value than all the rightmost cards in all the rows, then that card gets placed in the row with the card of the highest value to the right of that card. If a player runs out of cards, they then sit out till all the cards have been played. When all players have played their cards, then everyone counts the bullets in their victory piles and the highest total wins. You can play a Solo hand Game or a Match Play Game which would be three hands. In Survival Mode, each players objective is to not capture any Walker cards. Deal 10 cards to each player. There are no Hero cards in this mode. Set up the 4 rows as normal. Each player places 1 card facedown in front of him or her. Again all cards are simultaneously revealed and then the cards are placed in numerical order, lowest to highest in the rows. Cards are placed in the same manner as Hero Mode except in this instance. If the card played is lower than all the right most cards in the rows, then the player must capture a row of Walker cards of their choice. Of course, the row with the fewest points in it is the usually the best choice here. Scoring rows works the same way in this mode. Once a 6th card is played, that player captures the row and places the 6th card to start the new row. The game ends when all 10 cards from each player has been played. Then count up the total score and the lowest score wins. Again a Solo Hand Game or Match Game can be played. The Walking Dead Card Game is a very simple, easy and quick game. It’s a nice little filler game when a group is waiting for people to show up for board game night or if you are just killing a quick few minutes. It’s not a deep game but there is a bit of strategy to it in how each player play their cards. It’s not my first choice for a filler game but it isn’t bad either. It’s basically a remake of 6 Nimmt in the way the mechanics operate. The theme of The Walking Dead plays no real part in this game. You could have put anything on these cards and it wouldn’t have made a difference. There are only 4 different zombie pictures in the game, so if you are a Walking Dead fan and are hoping this is a cool zombie game, it’s not. It’s a quick card game and the theme is irrelevant. However, that doesn’t take away from the fact that is a nice light game and certainly worth the price. This is a good social game, as it doesn’t require a lot of thought for strategy and people can talk freely and have a good time with out upsetting anyone for not being serious about the game. The card thickness and weight are of decent quality so they wont wear out right away but if you plan on playing this a lot, getting card sleeves is always recommended. It comes in a box that isn’t oversized and the artwork is typical of a licensed TV product. I will give this game about a 6 out of 10 stars as it does lack depth and it was certainly done without a lot of theme put in mind. It was a chance to grab a popular show license and put a game to it. However, again, for people who aren’t into heavy games and just want something quick and fun, then The Walking Dead Card game isn’t a bad choice. Okay, so the truth is, this game could be about pretty much anything, the Walking Dead reference pretty much is a gratuitous marketing ploy (but you knew that already). That said, it certainly doesn’t distract from the game. This is a quick to learn game that has two modes, with two rules for each mode. Easy peasy. It takes a few rounds of play (that are really quick) before you start playing strategically. It’s fun, but I’m not sure how often I’ll reach for it. Perhaps if the packaging was better. This should have been one, maybe two decks in a box that fits in your pocket. Instead it’s in an over-sized box that will keep it stuck in the game chest. Add a Review for "The Walking Dead Card Game"